We always enjoy the opportunity to visit with our customers to say hello and offer the chance to learn more about our products. We are on the road again with exhibits at three popular trade shows, with two more shows to come. First, a big "Thank You" to all our Central and South American customers who stopped by our booth at AHR Expo Mexico in Mexico City. Many old friends stopped by, along with new visitors interested in what we have to offer. Our Spanish speaking staff was present in the booth along with translations of our catalogs and product datasheets into Spanish for the convenience of all. Our BAScontrol products received a great deal of attention, thanks to their support of open source tools and an open programming language, Sedona. Using a BAScontroller and our free programming tools, system integrators can create custom applications using drag and drop programming. Our free pre-built applications, as well as examples of the free tools available for use with our controllers drew a great deal of attention. The BASgateways were also well liked with their simplicity and our existing library of profiles for Modbus devices. Then it was on to the Honeywell Momentum show in Orlando, FL. The conference, themed You've Got Connections, provided the opportunity for more than 300 distributors, contractors, sponsors, and staff to evaluate top trends in the building automation industry. On display were our popular BASrouters and BASgateways which provide routing and access solutions. These products integrate readily with new and existing BACnet controllers to create an integrated building automation solution. The CTRLink line of Ethernet products provides all the building blocks for Ethernet and IP connectivity with options for RSTP redundancy and Secure Remote Access. But wait, there's more! Visitors to Stand K2 at the Smart Buildings Show in London, UK found us displaying our range of control products for commercial and domestic applications to system integrators and OEMs. Billed as the UK's Leading Smart Building Event, the show allowed Contemporary Controls the opportunity to offer visitors the information they need to make informed decisions regarding building automation. 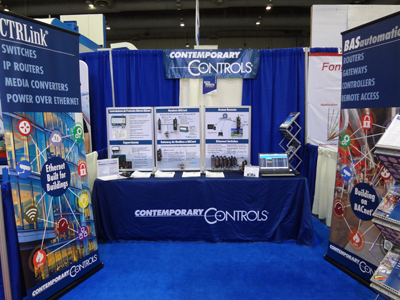 On display were our BASpi, a next generation controller and the BAScontrol family of open control products. If you missed us, don't worry. Visit Contemporary Controls at Stand 10.0-141 at the SPS/IPC Drives show in Nuremburg, Germany from November 27-29, 2018 or the Distech Controls' Connect 2018 Conference, December 3-5, in Miami, FL. We hope to see you there.